Lock in a great price for Best Western Plus Raffles Inn & Suites – rated 8.4 by recent guests! Room & bathroom were clean except for the carpet. Family suite worked well for 2 kids and 1-2 adults, cannot imagine it at capacity of 6 people. Breakfast was solid. 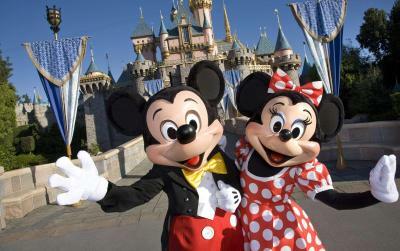 Close proximity to Disney. The bunk beds were great for the kids they really loved it. Great breakfast. Location was a little further away than we like, but the room size was nice for our family. The room was nice had a big bathtub with jets. Very great for relaxing after a long day of walking in the parks. The family rooms, enough space for everyone in are party. The breakfast was great just wish they had something different each day. It was a great room for a great value and very close to my destination. We had a wonderful stay! It was so much coming back to our room each day, the maid had the kids stuffed animals and blankets different and cute. Breakfast was great and everyone was full before we started a fun adventurous day! We loved being so close to the toy story parking, for our little ones legs! This was our 2nd stay here and I'd say it was better than the 1st! 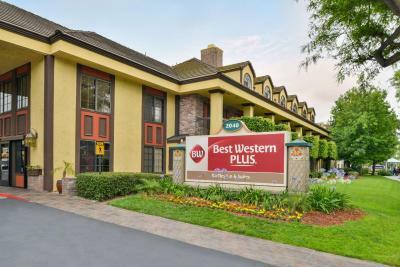 Best Western Plus Raffles Inn & Suites This rating is a reflection of how the property compares to the industry standard when it comes to price, facilities and services available. It's based on a self-evaluation by the property. Use this rating to help choose your stay! 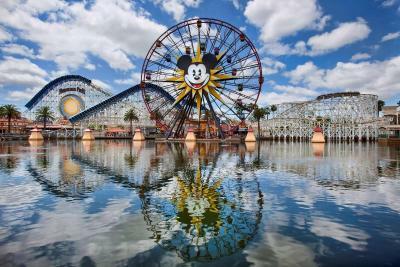 One of our top picks in Anaheim.This family-oriented, Anaheim, California hotel offers Disneyland Theme Park tickets at the reception desk. It features an outdoor pool and hot tub and serves a daily hot breakfast. Disneyland is just 1 miles away. Offering free WiFi, rooms at Best Western Plus Raffles Inn & Suites offer a flat-screen TV and video games. The comfortable, stylish rooms include a microwave, a refrigerator and a work desk. Family suites with bunk beds are also available. Guests can enjoy a full hot breakfast where they can make their own waffles at Best Western Plus Raffles Inn & Suites. Indoor or outdoor seating is available. Best Western Plus Raffles Inn & Suites offers a Disney-themed gift shop in the lobby. 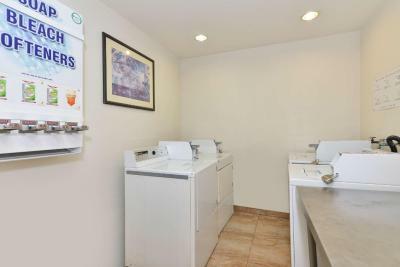 Other on-site amenities include a business center and a launderette. Anaheim Convention Center is a 5-minute walk from Best Western Plus Raffles Inn & Suites. Knott's Berry Farm is 8 miles away. Shopping at South Coast Plaza Mall is a 15-minute drive away. The hotel offers shuttle services to this mall as well as other locations. When would you like to stay at Best Western Plus Raffles Inn & Suites? A fiber optic flat-screen TV, a work desk, a refrigerator, and microwave are provided in this room. Free WiFi is provided throughout. Two full bathrooms are featured in this suite. 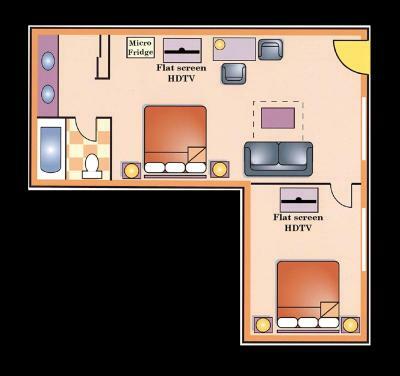 A fiber optic flat-screen TV is in both bedrooms. A maximum of 8 guests can be accommodated in this suite. French doors lead to the second room in this suite. 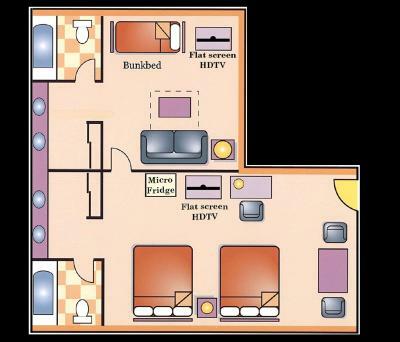 A flat-screen fiber optic TV is featured in each bedroom. A work desk, an activity table, a refrigerator, and microwave are provided in the main area. A vanity area is featured near the bathroom. Free WiFi is provided throughout. A maximum of 6 guests can be accommodated in this suite. This kids suite offers a 40-inch flat-screen TV, work desk, activity table, refrigerator and microwave in the main area. There is a French door that leads to the second room with a bath and vanity area, sofa bed, bunk beds, small table and a 32-inch flat screen TV. House Rules Best Western Plus Raffles Inn & Suites takes special requests – add in the next step! Best Western Plus Raffles Inn &amp; Suites accepts these cards and reserves the right to temporarily hold an amount prior to arrival. Best Western Plus Raffles Inn & Suites accepts these cards and reserves the right to temporarily hold an amount prior to arrival. So noisy! And an unexpected additional fee that we only learned about arty check in. Carpet was filthy & stained - super disgusting. Breakfast was exactly the same every day - could use a bit of imagination to help change it up for guests staying more than 1-night. That it only has one elevator. The comforter on the bed could have been thicker then what it was. Breakfast buffet had an excellent selection and the staff were extremely helpful and pleasant. Really disappointed. Beds were hard, walls were paper thin, so sleep was difficult. Desk staff were not helpful. Pool was extremely small and entire property in need of a refresh/makeover. 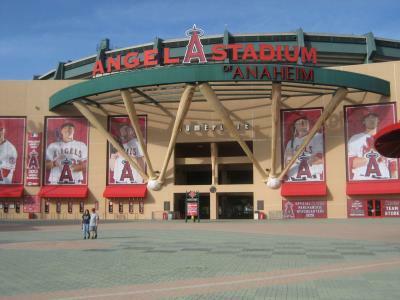 I’ve stayed in better properties in Anaheim for less/comparable $. The room was a bit dark we were places in a corner room only had one window. Booking.com didnt show a $100 deposit so I was surprised with that. You need to update that for the future. It was noisy. I could hear the people above me walk and run across the flor. Bed was noisy, room was noisy as you can hear upper level walking and stomping. Hear other people’s showers running.